It’s next to impossible to find a non-toxic, triclosan-free foaming hand wash. Triclosan is the main ingredient in nearly all antibacterial hand soaps but it is toxic. BabyGanics has a great foaming hand wash that is triclosan-free, but it is very pricy at almost $1 per ounce. You can find BabyGanics at Babies R Us. The good news is you can use your current foaming hand soap containers and make your own for practically pennies! 1. Find the “fill to this line” mark on the empty hand soap container so you can be sure not to overfill. 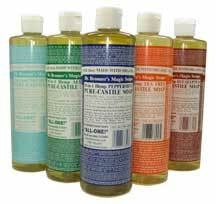 You will use 4 or 5 parts water and 1 part Dr. Bronner’s. So if you have a 6 ounce container, you will use 5 ounces water to 1 ounce soap. 2. Fill your the container with the appropriate amount of the distilled or purified water. 3. Add the appropriate amount of Dr. Bronner’s soap up to the line. 4. You may choose add 1 drop of tea tree oil for antibacterial properties. Many do not like the strong smell, so do not add more than a drop or 2 if you choose to add it at all. 5. Screw on the top, give a gentle shake or swirl, and wash your hands! If you find it is too soapy, or not soapy enough, you can add more or less soap the next time you make it. Try different scents throughout the year. Peppermint would be nice in the winter (though it is tingly and may make your hands feel a little cool). Making your own also ensures it’s free of parabens, formaldehyde and dioxanes. Do you know where I can find foaming hand soap dispensers for a reasonable price? I want to make this soap for Christmas gifts for my friends and family, so I’m going to need a lot of them. Thank you! I reused some foaming dispensers that I had at my home (like an empty BabyGanics foaming soap dispenser), but the ones above are great options for gifting!